I’ve made it through another week, which according to my OB is a milestone. She seems to think that based on the size of these babies, and how I am carrying them, that there is no way I will make it until March 12 for my C-section. The section is scheduled, mind you, for 1:30 PM on that day, but she’s told me that it doesn’t really matter, because I’m not going to be there. Ok then! My plan is to be stubborn and hold on to these babies for at least another 2 weeks, taking me to 36. 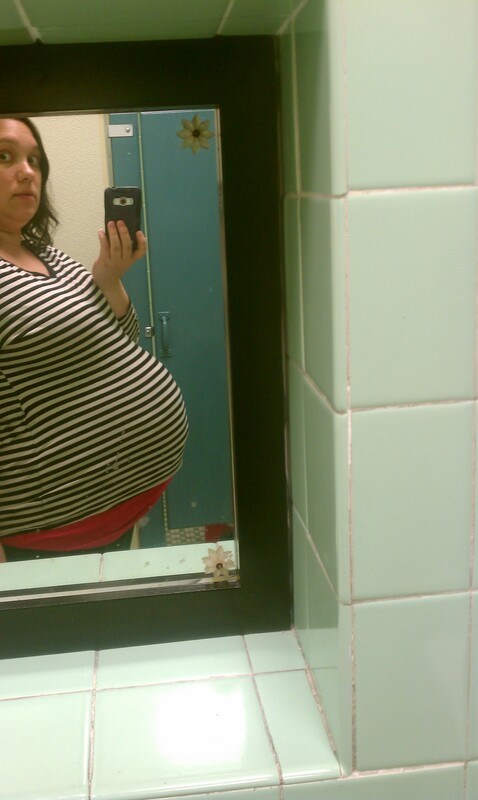 I will be 34 weeks tomorrow, and while I am very uncomfortable, I really think I can do 2 more weeks. I have to. We aren’t quite ready for these babies yet anyway. I’ve pretty much put myself on a modified bed rest at this point. For every hour I am up doing something, it seems as though I need 3 or 4 hours to recover. I’m taking it easy as much as I can, sitting whenever possible and lounging on our chaise whenever I can. I’ve made it through washing and folding all the baby clothes, burp cloths, towels and wash cloths. Ed is under orders to get the car seats installed. My bag and the baby bag are packed. Our bedroom remains gutted, so that is Ed’s priority. I’m hoping to have walls in there by the end of the weekend–I would really like to get their beds put together. Today we have the first of our weekly sonograms and from what I am told, today will be a quickie–not necessarily measuring the growth since last week, but just checking fluid, heart rate and positions. I’ve felt like maybe there are more feet in my ribs these last few days, but that may just be wishful thinking/my imagination. (Flip Molly, Flip!!) Ed is coming with me because the OB said to be prepared to be admitted after any of the sonograms from this point forward. I feel like that’s a little bit of overreacting, but whatever. Who am I to say, I suppose. I’ve got some thoughts on having a C-section that I want to write out, but I think it’s a post for a different day. I did get one picture of myself this week–at a wellness event at school of all places. When I look at it, I feel like there is no way I should physically be able to be up and walking around, and yet I am. Thank God for those extra long tanks I bought from Old Navy. None of my other shirts hide my belly anymore. I would be screwed! Your face is that picture is priceless!! I think of you every day, my friend. You and those BABIES!!! Hard to believe how fast it’s going. Someone asked me if I was sure I wasn’t having twins recently. I laughed & said “Yes, I’m sure.” He was joking (someone I know well), so I didn’t kick him. But telling my mom that she said “Can you imagine”. I told her yes, I’ve seen Sara’s pictures. 😉 I’m nowhere near that. So crazy to think that it could be any day now. Will you just leave your bags in the car for each appointment? Yikes! So much to take in. Hang in there! You’re doing great. Maybe you’ll prove your doctor wrong. I also LOVE your face in this pic! It just speaks volumes! (Along with your Bell-eh!) I am also thinking of you just about ALL DAY!!! Yes, put the bags in the car, please! Home stretch! AIEEEE! You can do it! Also, when you said your bedroom was gutted, I thought you just meant it was messy, and I was like, no big deal! But you mean ACTUALLY. No WALLS??? I want to give you a hug and some tea. 1. You look so cute. My face would be continually covered in tears of self pity, probably, so every time I see your face I think you have a great attitude! I know how uncomfy I am with just ONE, smallish baby in there by the end and am very impressed! I CANNOT believe how close you are to having your babies!! 64% of the people don’t know that a woman in her forties has lower likelihood of getting pregnant than in the thirties. This just shows the amount of ignorance among general public regarding the factors that affect chances of pregnancy. As a matter of fact fertility in the women diminishes with her age and at the age of 20-24 it is 86%, by the age 30-34 it is reduced to 63%, which is further reduced to 36% when she reaches the age of 40-44 and by the age of 50 the chances of pregnancy by natural way are reduced to near zero percent.